ملکیان, منصوره, جعفری, رضا. (1390). استفاده از فناوری سنجش از دور در حفاظت از تنوع زیستی. فصلنامه علمی- پژوهشی اطلاعات جغرافیایی « سپهر», 20(80), 18-22. منصوره ملکیان; رضا جعفری. "استفاده از فناوری سنجش از دور در حفاظت از تنوع زیستی". فصلنامه علمی- پژوهشی اطلاعات جغرافیایی « سپهر», 20, 80, 1390, 18-22. ملکیان, منصوره, جعفری, رضا. (1390). 'استفاده از فناوری سنجش از دور در حفاظت از تنوع زیستی', فصلنامه علمی- پژوهشی اطلاعات جغرافیایی « سپهر», 20(80), pp. 18-22. ملکیان, منصوره, جعفری, رضا. استفاده از فناوری سنجش از دور در حفاظت از تنوع زیستی. فصلنامه علمی- پژوهشی اطلاعات جغرافیایی « سپهر», 1390; 20(80): 18-22. استفاده از داده ‌های سنجش از دور در تعیین مناطق با اهمیت از نظر تنوع زیستی، پیش بینی نحوه پراکنش گونه‌ها و مدل ‌سازی پاسخ های جوامع زیستی به تغییرات طبیعی و انسانی یکی از موضوعات مهم در تحقیقات به شمار می ‌رود. پارامترهای محیطی با داشتن خصوصیات زیست- فیزیکی معین می‌توانند بیانگر نحوه پراکنش و فراوانی گونه‌ ها در سطح سرزمین بوده و چگونگی اشغال زیستگاه‌ها توسط گونه‌ها را نشان دهند. داده‌ های جدید حاصل از فناوری دورسنجی امکان ترکیب آنها را با مدل های بوم شناختی برای پاسخگویی به سؤالات متعدد در زمینه تنوع زیستی فراهم ساخته‌اند. پیشرفت ‌های اخیر در زمینه قدرت تفکیک مکانی و طیفی سنجنده‌ ها، مطالعه جنبه‌ های مختلف تنوع زیستی نظیر شناسایی اجتماعات گونه‌ ای، برآورد غنای گونه‌ای، تعیین متغیرهای اقلیمی و بررسی ساختار زیستگاه را ممکن نموده است. در مواردی که تشخیص مستقیم یک موجود زنده ممکن نباشد با استفاده از رویکرد دورسنجی غیر مستقیم و از روی خصوصیات زیست- فیزیکی می‌توان اطلاعات معنی داری را استنباط نمود. مقاله حاضر مروری دارد بر کاربرد سنجش از دور در مطالعات تنوع زیستی و حفاظت که شامل استفاده از دورسنجی مستقیم و غیرمستقیم در شناسایی گونه‌ ها و جوامع، برآورد غنای گونه ای، تعیین متغیرهای اقلیمی و بررسی ساختار زیستگاه می­‌باشد. امروزه همکاری بیش از پیش محققان سنجش از دور با پ‍ژوهشگران عرصه تنوع زیستی و حفاظت لازم است تا بتوان در راستای اهداف حفاظت بهتر گام برداشت. Application of remote sensing data in identification of important areas in terms of biodiversity, prediction of the mechanism of the distribution of species and modeling the responses of biosphere communities to natural and human changes is one of the important issues in research. Environmental parameters with certain bio-physical characteristics can indicate the mechanism of distribution and frequency of species at the surface of the land and explain how the habitat is occupied by species. New data from remote sensing technology have made it possible to combine them with ecological models to answer many questions about biodiversity. Recent advances in spatial and spectral resolution of sensors have made studying various aspects of biodiversity, such as identifying communities of species, estimating species richness, identifying climatic variables, and studying the habitat structure possible. In cases where direct recognition of a living creature is not possible, by using the indirect remote sensing approach, we can derive meaningful information from the bio-physical properties. This paper reviews the application of remote sensing in biodiversity and conservation studies, which involves the use of direct and indirect remote sensing in identifying species and communities, estimating species richness, identifying climatic variables and studying the habitat structure. Today, it is necessary to form increasing collaboration between remote sensing researchers and researchers in the field of biodiversity and conservation, so that steps can be taken towards better conservation goals. 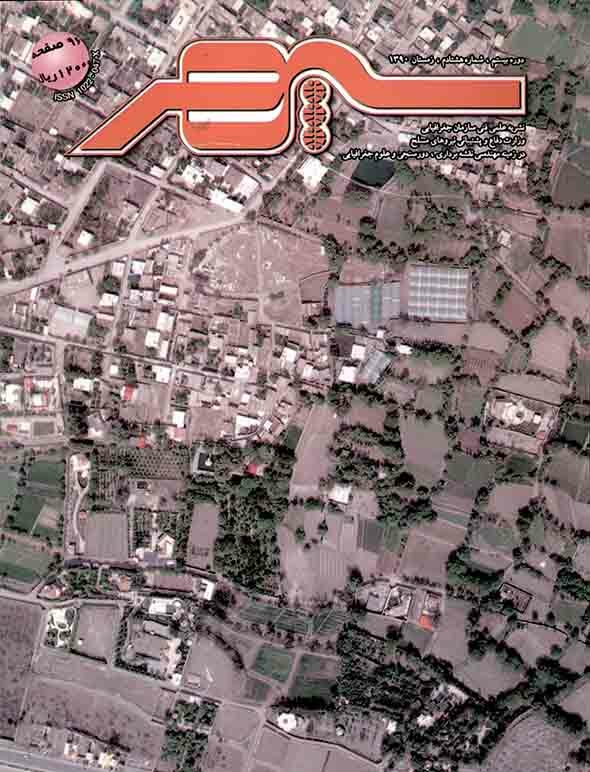 1- Abileah, R . (2001) High-resolution imagery applications in the littorals. In 8th International Symposium on Remote Sensing, SPIE, Toulouse, France (17-21 September) http://www.erg.sri.com/publications.html. 2- Albright, T. and etal. (2002). The Abundance and Distribution of Water Hyacinth in Lake Victoria and the Kagera River Basin. 1989-2001, USGS/EROS Data Center and Clean Lakes. 3- Drake, J. B. and etal . (2002) Estimation of tropical forest structural characteristics using large-footprint lidar. Remote Sens. Environ 79: 305-319. 4-Farr, T. G. and M. Kobrick (2000). Shuttle radar topography mission produces a wealth of data. Am. Geophys. Union Eos 81: 583-585. 5- Gardiner, E. P. and J. L. Meyer (2001). Sensitivity of RUSLE to data resolution: modeling sediment delivery in the Upper Little Tennessee River Basin. Georgia Water Resources Conference. K. J. Hatcher, University of Georgia: 561-565. 6- Gaston, K. J. (2000). Global patterns in biodiversity. Nature 405: 220-227. 7-Guenther, G. C. (1985). Airborne Laser Hydrography. USDepartment of Commerce. 8-Harding, J. S. and etal. (1998). Stream biodiversity: the ghost of land use past. Proc. Natl. Acad. Sci. U. S. A 95: 14843-14847. 9- Huston, M. A. (1999). Local processes and regional patterns: appropriate scales for understanding variation in the diversity of plants and animals. Oikos 86: 393-401. 10- Jenson, S. K. and J. O. Domingue (1988). Extracting topographic structure from digital elevation data for geographic information system analysis. Photogramm. Eng. Remote Sens 54: 1593-1600. 11- Johnson, D. D.P. and etal. (1998). Contemporary environmental correlates of endemic bird areas derived from meteorological satellite sensors. Proc. R. Soc. Lond. Ser. B 265: 951-959. 12- MacArthur, R. H. (1972). Geographical Ecology: Patterns in the Distribution of Species, Harper & Row. 13-Nagendra, H. (2001). Using remote sensing to assess biodiversity. Int.J. Remote. Sens 22: 2377-2400. 14-Rosenzweig, M. L. (1995). Species Diversity in Space and Time. Cambridge University Press. 15-Scott, M. C. and G. S. Helfman (2001). Native invasions, homogenization, and the mismeasure of integrity of fish assemblages. Fisheries 26: 6-15. 16- Ulaby, F. T. and etal. (1982). Microwave Remote Sensing: Active and Passive Volume II: Radar Remote Sensing and Surface Scattering and Emission Theory, Artech House. 17-Waide, R. B. and etal. (1999). The relationship between productivity and species richness. Annu. Rev. Ecol. Syst 30: 257-300.